Sleep is one thing everyone needs but many people don’t not get enough of. When you’re spending (hopefully) eight hours a night on a mattress, you need to make sure that it is of good quality. A high-quality mattress affords you a restful sleep, and since you’re spending one-third of your day on it, you also want to ensure it is a safe sleeping environment. Organic mattresses are naturally free from chemicals and pesticides. For individuals who have sensitivities to certain chemicals or who simply want to live a more natural lifestyle, an organic mattress is an excellent investment. If an individual suffers from allergies to sensitivities to chemicals, dyes, and pesticides, they could benefit from the hypoallergenic properties of organic mattresses. While no true “hypoallergenic mattress” exists, natural and organic mattresses get close. Although natural wool and cotton mattresses do produce more dust than a mattress made of memory foam or other type of foam, this can be easily mitigated by using a dust cover. A dust cover will trap dust mites that cause itching, watery eyes, runny noses, and sneezing. Combined with the reduction or elimination of chemicals and dyes, this can be a powerful way for someone who suffers from multiple types of allergies to get a better night’s sleep. Do organic mattresses truly live up to the hype? Are they more expensive than traditional mattresses? What are the benefits of an organic mattress over a traditional mattress? These are common concerns customers voice when presented with the idea to go organic with their mattress. Unlike traditional mattresses, organic mattresses are made with natural or certified organic materials. Organic materials are often sustainably farmed and environmentally friendly. When compared to traditional mattresses, both can offer excellent support and comfort, so it’s important to determine what your desires and needs are when it comes to purchasing a mattress. If sleeping on natural materials that have been sustainably sourced is an important part of your lifestyle, an organic mattress is a great choice. Organic wool and organic cotton are just as comfortable as their traditionally farmed counterparts. Anyone who has a sensitivity to chemicals or scents may find comfort in organic or all-natural cotton and wool. Additionally, organic and all-natural cotton and wool help regulate the sleeper’s temperature, ensuring they stay warm in the winter and cool in the summer. When comparing latex and memory foam mattresses, consider your personal needs first. When a sleeper faces a latex allergy, they likely seek out memory foam mattresses to obtain the same type of support and feel that is common in a latex-based mattress. Latex mattresses are commonly purchased because they are made with natural materials; however, some people may feel that they’re not as comfortable as memory foam. Educate yourself on the differences between latex mattresses and memory foam in order to choose the best mattress that will contribute to your overall sleep experience. Expect that a mattress made of latex will be of great quality. It can help reduce allergic reactions caused by dust. Taking a closer look, there are a number of latex options available. Two popular ones are Dunlop and Talalay latex. Both are natural latex, and neither contains any synthetic materials. Dunlop and Talalay latex undergo different manufacturing processes to produce mattresses with differing levels of support. Depending on your body’s individual support needs, a sleeper may be more drawn to one type of latex over the other. Test out both and see which one you prefer. Keep in mind that “certified organic” is largely a marketing term; organic mattresses as a whole are actually not regulated by the government, although they can include certified organic components, like cotton or wool. Be sure to always read the label on the mattress to gain a better understanding of its contents. Contrary to some claims, organic mattresses can be just as firm or soft as traditional mattresses. Like anything else, be sure to test out varying levels of firmness in an organic mattress to find one that is best for your individual needs. Some people stay away from organic mattresses because they assume they will be too expensive. However, natural and organic mattresses are very affordable and many brands and styles are on par with their traditional counterparts. There are many considerations to make when researching and shopping for an organic mattress. Those who seek natural mattresses may want to avoid exposure to chemicals, dyes, or pesticides, or sleeping as naturally as possible may be part of the lifestyle they want to live. 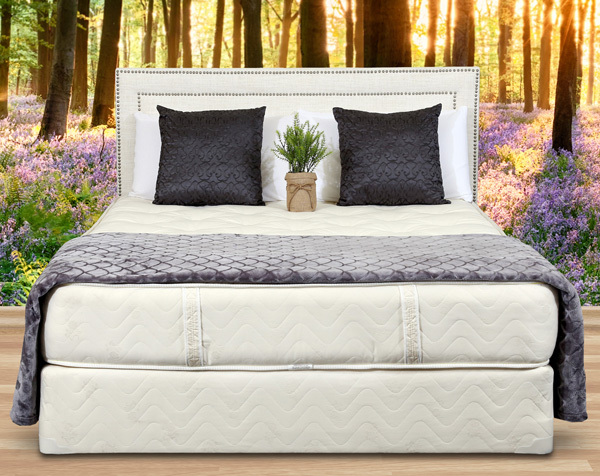 As you embark on a quest to choose a green or eco-friendly mattress, be sure to read up on the many different types of natural and organic mattress options that are available.